New 2014 stock is here now! All Shimano compatible Bracciano stock purchased from today 09/05/2013 is now Shimano 11sp compatible. We include a spacer for those riders using 8/9/10 speed, great news is you can buy your Bracciano now and transfer them onto a future bike. The good news for riders with older stock is that you just need to swap the freehub to change to 11sp in the future, we have the parts for this on hand. We've secured a stock of Shimano Ultegra 10sp 6700 cassettes, these are compatible with any 10sp Shimano groupset (105, Dura-Ace and Ultegra). With a small RD adjustment can also be used on a 10sp SRAM bike. If you'd like one of these, ask us about it when we call to confirm your web order or place a comment at the check-out as to which ratio you'd like. We generally have stock of 11-28 and 12-25. They are $75 and we will gladly install it for you if required at no extra cost (the right way, with a torque wrench). Please note we don't include the cassette in your total for free freight, its simply a value-add service for those people who don't have easy access to a cassette or the tools to install it. If you'd like to send us your existing cassette, as long as its clean we'll gladly install it for you and send your wheels out ready to ride for no extra cost. The Pro-Lite Bracciano has won the road wheel shoot out in UK Cycling Plus magazine. Despite being one of the cheapest wheels on test they won out against the competition. Bracciano uses the same hub as our popular Stelvio model, but with a more shallow rim and lighter spokes. The end result is a wheel durable enough to train on and light enough to win with. Similar to Fulcrum Racing Zero, Roval Echappee, Zipp Team Issue & Campagnolo Eurus. Non-Drive Side Spoke Braces now included standard for no extra cost, these were a special order for Australia. Most other markets don't have these braces yet! 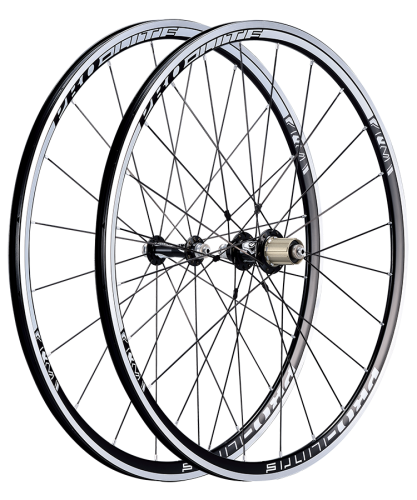 All Pro-Lite wheels are hand built from our cheapest training wheel to our most expensive Carbon models. Please view the below video to watch how our wheels are built. Please consider including the optional Pro-Lite Brake Pads. Although this wheelset is compatible with ANY brake pad, the Pro-Lite pads will offer you maximum braking performance in all weather conditions combined with minimal wear on the braking surface of your rims. Since pads are a lot cheaper than rims, we think they are a great investment! If you select this option you will be sent a full set of pads for the front and rear of your bike. If you need extras they can be purchased in our "Wheel Accessories" section. The wheels are quick to spin up to speed and have no trouble maintaining speed on the flats or in a bunch.